People with anxiety disorders are often prone to frequent worrying, feelings of nervousness, and negative thinking. For example, many people with panic disorder spend time worrying about the future or stressing about the past. Fortunately, relaxation techniques can help counteract these symptoms. Relaxation techniques are practices you can learn on your own, or with the guidance of a professional. These activities are aimed at assisting you in slowing down your thoughts, letting go of stress and opening up to deep relaxation. Such techniques can help counteract many of the cognitive and physical symptoms of panic disorder and anxiety. Common relaxation techniques include deep breathing, yoga, visualization, massage, and progressive muscle relaxation (PMR). Mindfulness meditation is another common relaxation skill that can assist with stress and anxiety reduction. Mindfulness meditation is a relaxation technique that brings your awareness back to the present. During mindfulness practice, the meditator allows thoughts to arise without trying to stop or judge them. For example, unpleasant thoughts related to fear, judgment, blame, and worry may come up. Mindfulness is the act of acknowledging these thoughts and allowing them to pass. Mindfulness meditation is based on the idea that most people push away or ignore their present thoughts and feelings. Many believe that if they ignore negative thoughts, those thoughts will simply go away. But mindfulness actually allows you to detach from negative thinking by facing thoughts without reaction. By letting uncomfortable thoughts pass without reacting, you can develop a new response to fear and anxiety. Over time, and with practice, mindfulness meditation can help create inner harmony, clarity, and peace. When you first begin to practice mindfulness meditation, it may be helpful to do so in a quiet, distraction-free area. The time of day you decide to meditate can be determined by your particular needs. For instance, some people prefer to start the day off with meditation, reducing morning anxiety and setting a clear and positive tone for the day. Others prefer to meditate at night, letting go of the stress of the day, and preparing for a good night’s rest. Try to set aside at least 5 to 10 minutes to sit in meditation, gradually increasing duration as you become more comfortable with your practice. Start off sitting or lying down in a comfortable position. To help focus, begin your meditation with a breathing exercise, and with your eyes closed. Then, simply notice your thoughts, allowing any ideas to come to your mind. Keep a nonjudgmental attitude as you let yourself remain in the present with your inner voice. When your meditation feels complete, take a few deep breaths and open your eyes. Mindfulness meditation may sound simple enough, but even routine meditators find it difficult from time to time. 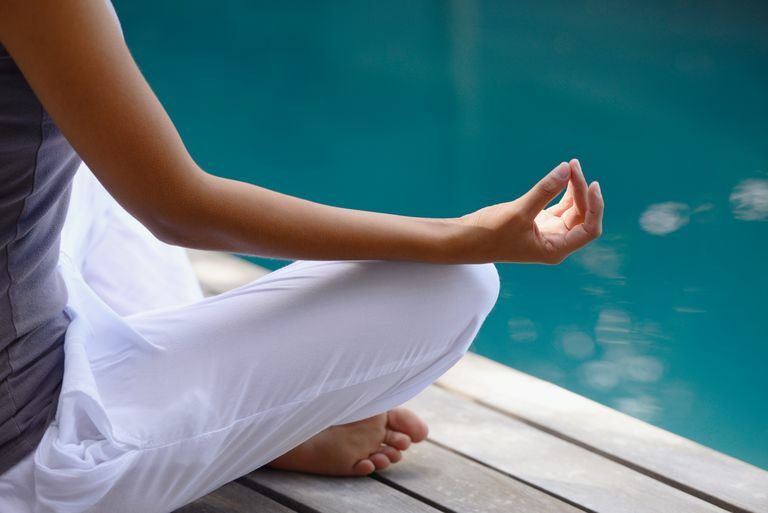 In fact, many people experience heightened anxiety when they first sit down to meditate. Motivation and desire may also wane from day to day, so try to be patient with yourself and your meditation practice. If you stick with your meditation practice, you will learn to sit with uncomfortable thoughts. Only through regular practice will mindfulness meditation become less challenging, help you to lower anxiety, and bring you a sense of inner peace. Chen, K. W., Berger, C. C., Manheimer, E., Forde, D., Magidson, J., Dachman, L., & Lejuez, C.W. (2012). Meditative Therapies For Reducing Anxiety: A Systematic Review and Meta-Analyis of Randomized Controlled Trials. Depression and Anxiety, 29, 545-562. Kabat-Zinn, J. (2005). Full Catastrophe Living: Using the Wisdom of Your Body and Mind to Face Stress, Pain, and Illness. New York: Bantam Dell. Miller, J. J., Fletcher, K., & Kabat-Zinn, J. (1995). Three Year Follow Up and Clinical Implications of a Mindfulness Meditation-Based Stress Reduction Intervention in the Treatment of Anxiety Disorders. General Hospital Psychiatry, 17, 192-200.